3D Visualisation (or Architectural Visualisation) is a niche industry. My limited experience in this field (about two years) has illustrated this to great effect and to be honest, up until I started studying Interior Design, I never knew it existed. But when I witnessed first hand the astounding photo-real results and the obvious benefits to an Interior Designer (and his/her client), I immersed myself in this 3D world. Before I knew it, I was offering a freelancing 3D Visualisation service. And I wanted to share my excitement. I wanted to make sure that local Interior Designers knew about this amazing technology too. Then surely local Interior Designers would be just as excited and inspired by this ground breaking software? Initially, I set about creating newsletters, which I emailed to all the Interior Design firms located in Northern Ireland. I was expecting lots of enthusiastic email responses demanding to know more about my 3D Visualisation service. There was little to no response: nada, zilch. And yet, I still received little to no response from Interior Designers in Northern Ireland. To date, most of my clients from the Interior Design field are located in UK Mainland. In the two years that I have provided a 3D Visualisation service, only two Interior Designers based in Northern Ireland have availed of my service. Northern Ireland has historically lagged behind when it comes to cutting edge design/technology. I’ve touched on this in a previous blog post but if I’m spelling out in no uncertain terms, the fact that this software exists and has huge benefits to the Interior Designer, why are Interior Designers in Northern Ireland hesitant to consider availing of it? To say that I’m confused is an understatement! To remain current and successful, any business should be exploring and implementing new and improved methods of service delivery – from an Interior Design point of view, this should include various ways of conveying a design scheme. In this (digital) day and age, I don’t feel ‘mood boards’ or ‘sample boards’ (especially for big budget/commercial projects) should be the only communication tool at a Designer’s disposal. Especially for tenders/pitches to prospective clients. Never mind its use for portfolio purposes and online Interior Design services (which is becoming much more prevalent). In my mind, there are three reasons why Interior Designers in Northern Ireland don’t appear to avail of 3D Visualisation: fear (due to lack of knowledge/information; cost (the Interior Designer needs to engage with a 3D Visualiser to establish costs!! ); the service is already provided in-house. I acknowledge that perhaps a number of the larger Interior Design firms will have their own 3D Visualisation service but I have to admit, from the 3D visuals I’ve seen on a number of websites, the in-house offerings would be considered quite basic. As a 3D Visualiser from Belfast, Northern Ireland, I clearly want Interior Designers from Northern Ireland to embrace this continually evolving visual tool and its numerous benefits, not only for my own growing business but also for their growing business . And to my disappointment, my client base in Northern Ireland continues to be non-existent. 3D Visualisation can bring a design concept to life! The results speak for themselves. Are you an Interior Designer based in Northern Ireland? 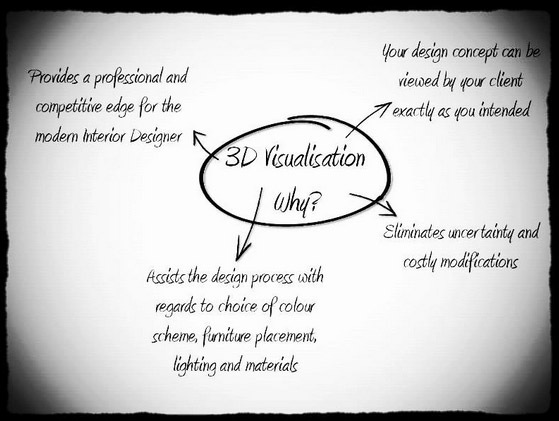 Do you opt out of including 3D Visualisation as part of your design service? If so, why? Please leave a comment, I’d love to hear from you! Louise, thanks for taking the time to leave your thoughts on this subject, I appreciate it. I can understand your concerns with regards to time but to be honest, I’ve created 3D visuals for large projects in two days. My client is only required to send me a floor plan (it doesn’t need to be to scale) and images/website links of the design elements; which can be sent via email. I even issue the Interior Designer with a checklist to make this process easier. The Interior Designer would need to spend a certain amount of time researching their ideas for the proposed design scheme (including sourcing/product selection) regardless, this would take longer than sending images to a 3D Visualiser via email. Yes, there are cost implications. But I always ensure my rates are as competitively priced as possible and there are ways to reduce costs, if necessary. Even if you feel that 3D Visualisation isn’t an essential service, I’m curious to know if you offer this as part of your design service? I know from experience, that once a client has been made aware of the option to have 3D visuals, they do show interest in this.